Ray Zabron, Animal Control Officer, investigate complaints, capture and impound stray, vicious, or injured animals in the Town of Eden. He is also responsible for enforcing ordinances governing licensing, impounding, humane treatment, sanitation and disposal of animals. Please do not handle wild animals unless there is an imminent threat to yourself. All dogs picked up by the Dog Control Office will be housed at the Eden Vet Clinic. Please call and report dog control issues to the Eden Police (992-9211). 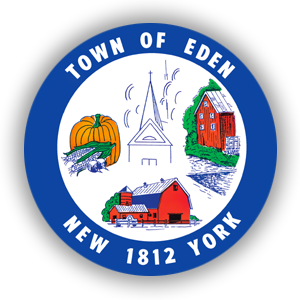 To redeem your dog, you must first go to the Eden Town Clerk’s office and provide proof of current up-to-date rabies vaccination and current up-to-date dog license information. If your dog is not currently vaccinated or licensed, this must be done before the dog can be released. The Eden Vet Clinic will vaccinate your dog at your cost.The fee for housing your dog is $30.00 for the first day, with $25.00 for each additional day ($200.00 maximum). The Vet Clinic tries to post all dogs that we bring in to them online at WNY Lost and Found Pets­ Facebook. Note to dog owners: If your dog is microchipped, please make sure that all phone numbers and addresses are current with the company that your dog is microchipped with. If you move and your dog gets lost (and your old phone is disconnected) we have no way to find you and reunite you with your dog. We recommend that your dog wears a collar with identification at all times. We recommend that for all dogs with invisible fence collars on that you routinely check your fence collar batteries. Report all dog bites to the Eden police. No person shall keep more than three dogs (four months of age or older) on any premises in the Town of Eden. Notwithstanding the foregoing, a person residing on and having control of premises which are at least five acres in area may keep on such premises up to six dogs (four months of age or older). For residents having problems licensing dogs because of conflicts with their work hours, there is a drop box in the back door of the Town Hall where information can be left for the Town Clerk, after hours. Rabies is a serious threat in our area, we urge you to avoid all contact with wild animals, do not handle orphaned raccoons, it is against NYS Conservation Law. Report all human contact with wild animals to the Eden Police.